NASHVILLE, Tenn.—Since the 1950s, the IRS has banned preachers from endorsing candidates during church services. Most Americans seem to like it that way. Eight in 10 (79 percent) say it is inappropriate for pastors to endorse a candidate in church. Three-quarters say churches should steer clear of endorsements. Yet fewer than half want churches to be punished if they do endorse candidates. Those are among the findings in a new report on religion and politics from Nashville-based LifeWay Research. Scott McConnell, executive director of LifeWay Research, says there’s little enthusiasm for political endorsement by pastors or churches. The ban on endorsements, known as the Johnson Amendment, dates back to a conflict between then-U.S. Sen. Lyndon Johnson and a Texas nonprofit, which opposed his re-election bid. Approved in 1954, the IRS rule bans all 501(c)(3) nonprofits, including churches, from active involvement in political campaigns. Since 2008, a group of mostly Protestant pastors has challenged the ban each year by endorsing candidates in an event called “Pulpit Freedom Sunday.” Recent polling shows few churchgoers have heard their pastor endorse a candidate. The Johnson Amendment has been a point of contention this election season. The new LifeWay report compares results from telephone surveys of 1,000 Americans about religion and politics in 2008 and 2015. Researchers found disapproval of endorsements remains strong. In 2008, 86 percent of Americans disagreed while 13 percent agreed. One percent were not sure. In 2015, 79 percent disagreed, while 19 percent agreed. Two percent were unsure. Support for endorsements was tepid across denominational lines in 2015. Few Protestants (20 percent) or Catholics (13 percent) see endorsements as appropriate. A quarter of those with evangelical beliefs (25 percent) agreed, while 16 percent of other Americans agreed. Support for endorsements outside of church declined slightly. In 2008, about half of Americans (53 percent) said it was appropriate for pastors to endorse candidates, outside of their role at church. In 2015, fewer than half (43 percent) agreed. Americans also want churches to steer clear of endorsements in general. 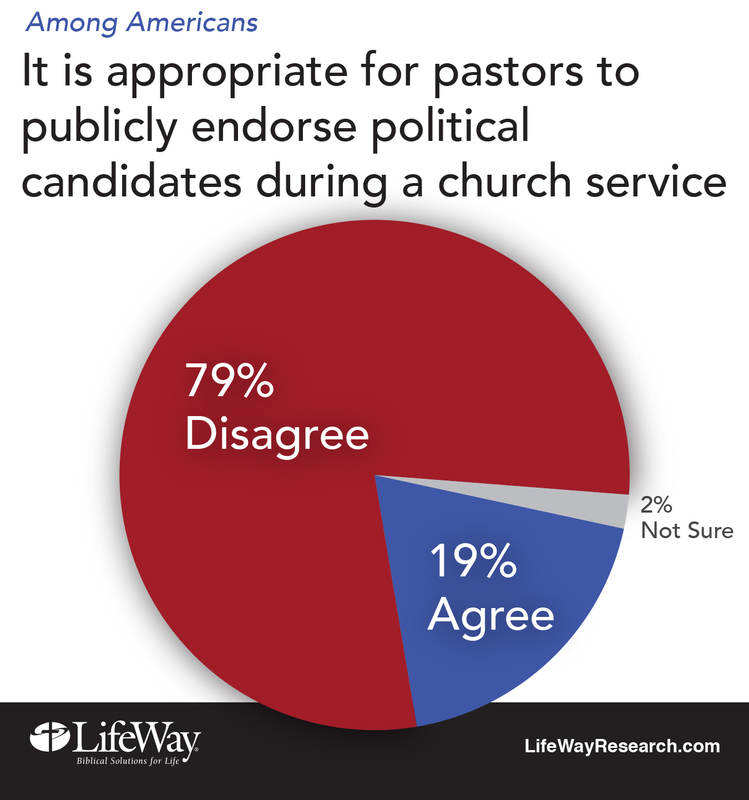 Three-quarters disagreed with the statement: “I believe it is appropriate for churches to publicly endorse candidates for public office.” Twenty-four percent agreed. One percent were not sure. A 2008 survey found similar results. Seventy-six percent disagreed. Twenty-two percent agreed. Two percent were not sure. Again, those who support endorsements remain in a minority across faith traditions. Three in 10 (29 percent) of those with evangelical beliefs said endorsements by churches are appropriate. Twenty-seven percent of Protestants agreed, as did only 18 percent of Catholics. Weekly churchgoers (29 percent) were skeptical as well as those who rarely or never go to church (18 percent). Most Americans also want churches to steer clear of any involvement with political campaigns. Eighty-one percent disagreed with the statement, “I believe it is appropriate for churches to use their resources to campaign for candidates for public office.” Seventeen percent agreed. Two percent were not sure. LifeWay Research found similar results in 2008. Thirteen percent agreed, 85 percent disagreed, while 2 percent were not sure. Fewer Americans think churches should be punished for their involvement in campaigns. 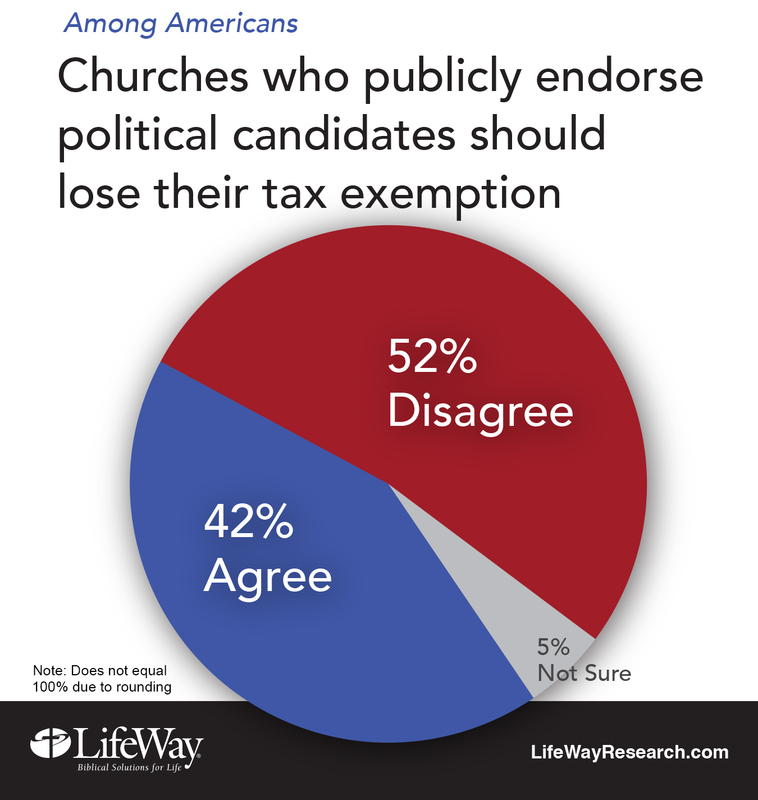 In 2015, fewer than half (42 percent) said churches should lose their tax exemption for publicly endorsing candidates. Fifty-two percent disagreed. Five percent were not sure. 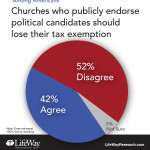 In 2008, more than half (52 percent) of Americans said churches should lose their tax exemption for publicly endorsing candidates. Forty-two percent disagreed. Six percent were not sure. Still, there are some demographic differences. Men (47 percent), those in the Northeast (46 percent) and those in the West (48 percent) were more likely to say churches should lose their tax exemption. Women (38 percent) and Southerners (37 percent) were less likely. Those from non-Christian religions (56 percent), nones (53 percent) and those who rarely or never go to church (52 percent) were more likely to agree churches should lose tax exemptions. Fewer Christians (37 percent), those with evangelical beliefs (33 percent) or those who go to church at least once or twice monthly (35 percent) agreed. For more information visit LifeWayResearch.com and view the complete survey PDF. The phone survey of Americans was conducted Sept. 14-28, 2015. The calling utilized Random Digit Dialing. Fifty percent of completes were among landlines and 50 percent among cell phones. Maximum quotas and slight weights were used for gender, region, age, ethnicity, and education to more accurately reflect the population. The completed sample is 1,000 surveys. The sample provides 95 percent confidence that the sampling error does not exceed plus or minus 3.6 percent. Margins of error are higher in sub-groups. Comparisons are also made to a LifeWay Research telephone survey of Americans June 12-14, 2008, using randomly dialed listed landlines.